Turkish newspaper Hurriyet is reporting that two explosions have occurred at Istanbul’s Atatürk Airport. The mayor of Istanbul has confirmed 28 deaths and 50 injuries. A gun and bomb attack on Istanbul’s Ataturk airport has killed 41 people, at least 13 of them foreigners, and injured more than 230, officials say. PM Binali Yildirim said early signs pointed to so-called Islamic State but no-one has so far admitted the attack. The death toll from the presumed Islamic State attack on Istanbul’s Atatürk Airport now stands at 36 people, while 147 others were injured. “According to the most recent information, 36 people have lost their lives,” Turkish Prime Minister Binali Yıldırım said early Wednesday morning, adding that “the evidence points to Daesh,” using the Arabic acronym for ISIS. The Prime Minister also confirmed that three suicide bombers opened fire on passengers with automatic rifles before detonating their explosives. “Turkey’s vengeance will come down like rain from hell,” he said. Tuesday’s bombing at Atatürk – the third-busiest airport in Europe – is the third suicide attack on Istanbul in 2016. Three suicide bombers opened fire then blew themselves up in Istanbul’s main international airport on Tuesday, killing 36 people and wounding close to 150 in what Turkey’s prime minister said appeared to have been an attack by Islamic State militants. The attack on Europe’s third-busiest airport is one of the deadliest in a series of suicide bombings in Turkey, which is struggling to contain the spillover from neighboring Syria’s civil war and battling an insurgency by Kurdish militants in its southeast. Police fired shots to try to stop two of the attackers just before they reached a security checkpoint at the arrivals hall, but they detonated their explosives, a Turkish official said. Update 8:08PM EST: Adding to evidence that the Islamic State is behind the attack, the Kurdistan Workers’ Party (PKK), the other major terrorist group active in Turkey, has disavowed the attack. According to pro-Kremlin news agency Sputnik, PKK leaders have stated they “played no part in Tuesday night’s coordinated terror attacks.” The PKK maintains friendly relations with Russia. I strongly condemn the terror attack at Istanbul Ataturk Airport and offer my condolences to the victims’ families and our nation. May Allah bless the souls of everyone who lost their lives in this heinous attack. The attack, which took place during the holy month of Ramadan, shows that terrorism strikes with no regard for faith and values. Nor do terrorists distinguish between their victims. This attack has also exposed once again the evil face of the terrorist organizations which target innocent civilians. This attack has no objective rather than making negative propaganda against Turkey. We expect the international community, especially the Western countries including their administrations, parliaments, media organs and civil societies, to take a firm stand against terrorism. Notwithstanding the heavy price it has paid in the fight against terrorism, Turkey has the power, determination and capacity to continue this fight until the end. I would like to remind you that such acts of terror target not only 79 million Turkish citizens but also entire human race of 7.5 billion. Given the heinous character of terror, the bombs that exploded in Istanbul today could have gone off at any airport in any city around the world. Make no mistake: For terrorist organizations, there is no difference between Istanbul and London, Ankara and Berlin, Izmir and Chicago or Antalya and Rome. Unless all states and the entire mankind join forces in the fight against terrorism, much worse scenarios which we fear even to imagine today may come true. The Ataturk Airport attack should serve as a turning point and a milestone in the fight against terrorism around the world, particularly in Western countries. I would like to once again wish Allah’s mercy upon our citizens who lost their lives and speedy recovery to those wounded. Update 6:25PM EST: Authorities are now placing the death toll at closer to 50, according to the Associated Press. The AP also notes that senior Turkish officials are leaning toward the Islamic State as the possible culprits of the attack. Hurriyet is citing witnesses speaking to CNN Türk as stating that they heard gunshots coming from the airport parking lot closest to the international terminal, where the explosions occurred. The Daily Mail reports that three suicide bombers were involved, but four men were seen running away from the site in the aftermath. Officials have confirmed that three attackers orchestrated the attack. At least one opened fire with an AK-47 firearm before detonating a suicide bomb he was wearing. Two other attackers committed suicide attacks on other areas of the airport. Turkish officials have been tight-lipped on suggestions indicating who may be behind the attack. Istanbul has been the target of multiple terrorist attacks in recent memory, all attributed either to members of the Islamic State terrorist group or to the Kurdistan Workers’ Party (PKK), a Marxist terrorist group, and its affiliates. 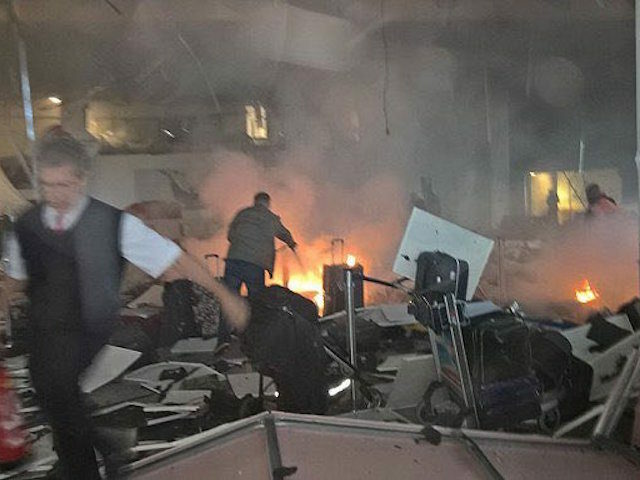 The pro-ruling party newspaper Daily Sabah cites a national security official noting, however, that there “are striking similarities between Istanbul airport attack and the recent attacks in Brussels airport,” orchestrated by Islamic State jihadists. As it is currently the Muslim holy month of Ramadan – when jihadis believe martyrdom in the name of Islam is even more highly rewarded in the afterlife – Islamist terrorists have an added incentive to conduct such an attack now. Initial reports indicate around 40 people have been injured in the explosion. This has been updated however; Turkey’s justice minister has told the press that only 20 injuries have been reported. Update: Habertürk reports that authorities believe two “members of a terrorist organization” threw four hand grenades at an X-ray machine in security. Four explosions were recorded before police began firing at the suspects. The broadcast governing body of Turkey has imposed an indefinite media ban on coverage of the bombings, which prevents Turkish outlets from reporting on it and officials from discussing the attack. This has become an increasingly common measure following terrorist attacks under President Recep Tayyip Erdogan. Update: Police have confirmed 28 dead and 60 wounded.